I'm starting a new occasional series on the blog today. It's called 'Home Improvement'. What is it and why? Our house is in a permanent state of un-finished-ness (yes I know that's not a word!) I want to feel it's done. I want to feel proud of it. We never have time to decorate, and we certainly never have the money. I want to move it up our priority list, and this series will act as a motivator. I want to be more creative with what we have and where we source things. I love to make and to sew and I do it for my job, but I would love an excuse to sew more for our home. I want to have at least one thing I've made in every room. I plan to tackle one room at a time, and give myself (or, let's be honest, ourselves, since I'll be roping my husband in) one month for each room. They won't always be completely finished by then (far from it), but they can certainly be improved. Hence, Room for improvement. I'm starting properly with August in our youngest's bedroom. 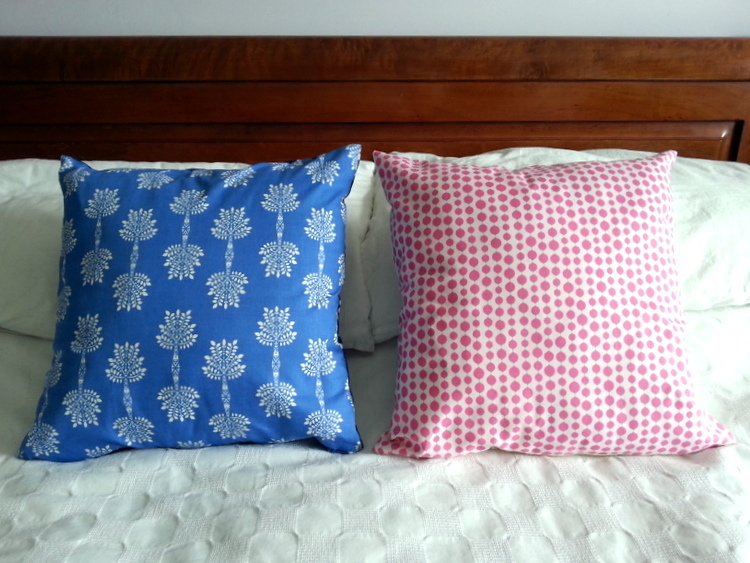 But until then, I've dipped my toe in the water with some new cushions for our bedroom. I love these prints and didn't want to sew and give them away. 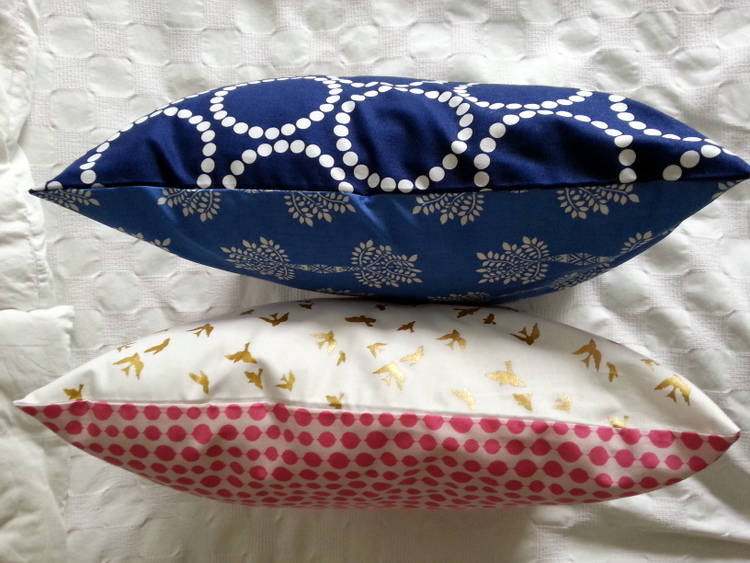 And I needed to time myself making cushions. So they became a sneaky project just for me! Sewing just for me! 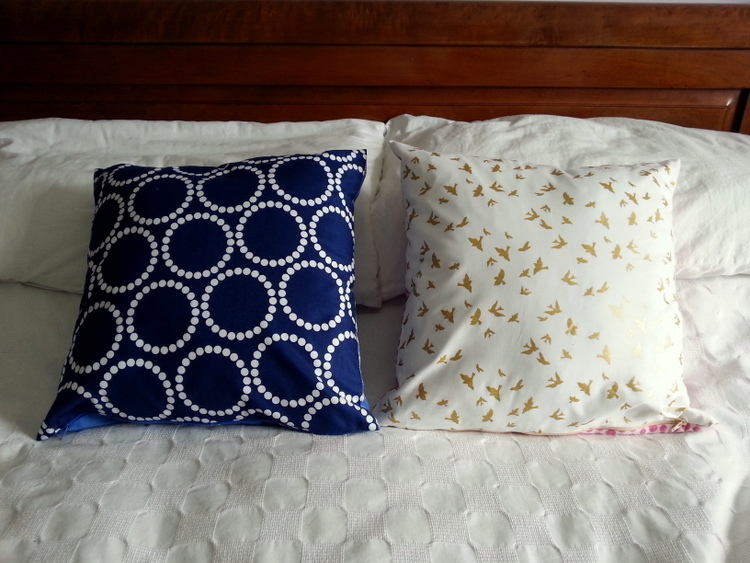 Yes, it's both my husband's and my bedroom but he would never say "Do you know, we really need some cushions," so it was definitely a selfish project. I was inspired by Things for Boys' #selfishswap and though the deadline was the end of June, I haven't got around to photographing and blogging these until now. What do you think? The good news, or the bad news depending on how you look at it, is that I'm inspired to sew a whole load more for our room. For those who are interested, I recovered the chair in Raindrop Poppies Bronze from Anna Maria Horner's Field Study line and blogged about it here. 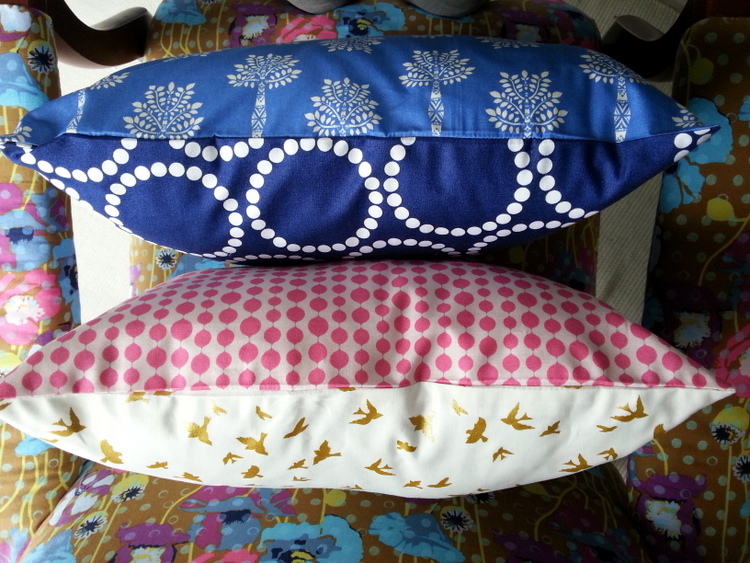 I made the cushions mostly using fabric from The Village Haberdashery, one of my most favourite online fabric stores. The fabrics, top to bottom (in the picture below) are... well I shouldn't have said top to bottom as I can't remember the first one! But I really love those Arabic-looking trees, so do tell me if you know. After that, it's Lizzie House's Pearl Bracelets in cosmonaut, Hothouse Flowers Seeds in pink, and Michael Miller's Brambleberry Ridge Flight in gold & white. Thanks Lins! I basically made nothing other than children's party stuff for about a decade, but we all have to start somewhere! Hope things are going well with your home improvements. The wood burner looks great! Thanks Jess! I have more planned when I finally get the time! Thanks Caro! That's very kind of you x. This is so clever I can't even stand it! Thanks Sarah! Nice to be called clever after having 3 kids: most of the time I feel the opposite! It's dangerous though - all that fabric I've bought promising myself they weren't selfish buys & I'd make them into things to gift or sell, now I'm thinking I'll keep them! Bad for the purse strings, great for the home! Ah, I love this idea! Both for the series and for the cushions. It's SO hard getting a house finished with all of life's other priorities, isn't it? Sometimes I say to my other half, I don't want to wait until we're retired to feel happy with this place! So I like your plan. These cushions are great, neatly done, and so cleverly thought out. Ideas like this amaze me, because these throw pillows are usable on both sides, and can be used far longer than a pillow with a single design side, which makes them very versatile. Cheers! Oh thanks Melissa, that's so kind of you! I think I'm going to make some more later this week. Watch this space! 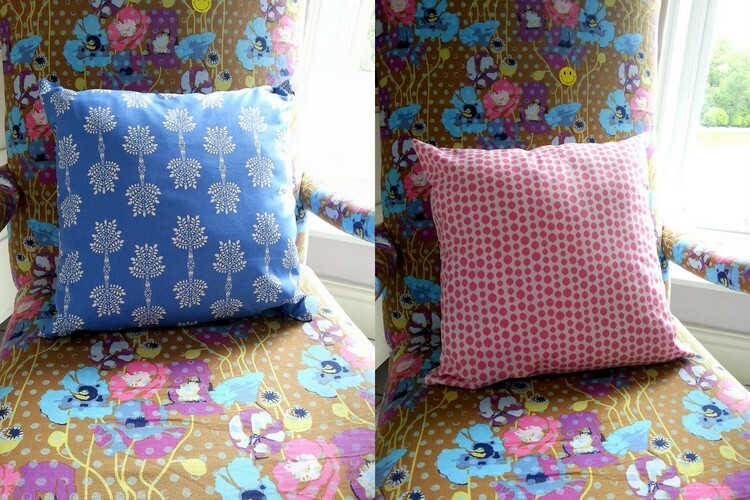 Lovely cushions! I just Love the fabric that u've used. If at all i know to sew.. i might have get them right done. Thanks Lissa. I know, the fabric is beautiful isn't it? You should see how much more pretty fabric I've got in my cupboard. I don't know whether to be proud or ashamed! 2011-2015 by a touch of domesticity. Please do not use or reprint my writing or original photos without giving credit where credit's due. Ask for permission where necessary. Thank you!